On 16 May 2014, Thomas P. Campbell, Director and CEO of The Metropolitan Museum of Art, announced that more than 400,000 images of public domain works in the Museum’s world-renowned collection may be downloaded directly from the Museum’s website for non-commercial use—including in scholarly publications in any media—without permission from the Museum and without a fee. The number of available images will increase as new digital files are added on a regular basis. This grand piano’s marquetried satinwood case, executed by George H. Blake, is unsurpassed in elegance and iconographic complexity. 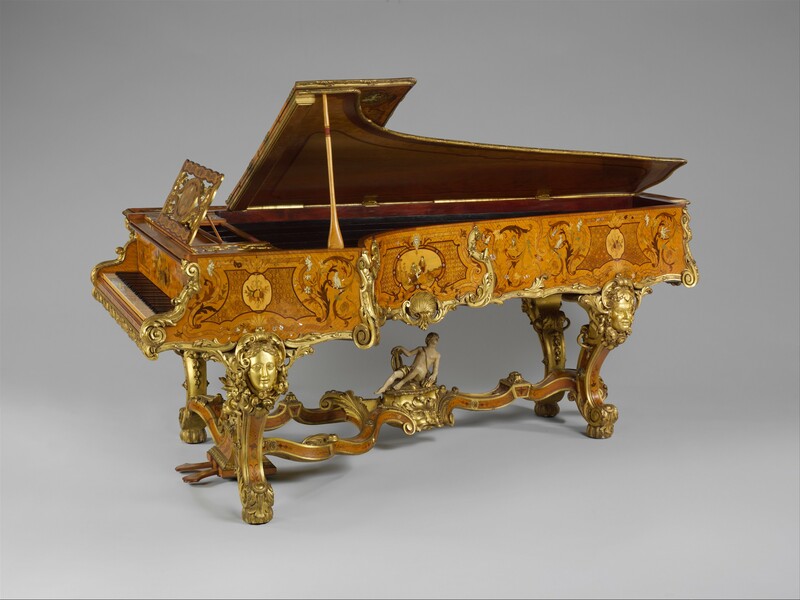 A nobleman’s showpiece, the piano was commissioned by Thomas Lord Foley from the London branch of a distinguished French firm. Erard’s eighty-note, double-escapement action was the most advanced of its time. The basis for modern grand actions, it accommodated the virtuosic pianism of Chopin and Liszt. The hammers are covered with felt, first used in place of leather coverings in 1826. Strings of the top twenty-six notes pass through a perforated brass bar that secures them against the hammers’ strong blows. Longitudinal steel bars reinforce the open-bottomed case. The painted and gilded stand is a separate construction in the Louis XV style. Picasso painted this portrait of his new lover, the Surrealist photographer Dora Maar (Henriette Theodora Markovitch, 1907-1997), during their yearlong sojourn at Royan, a small town on France’s southern Atlantic coast. As with many of Picasso’s depictions of Dora, she confronts the viewer with wide-eyed and high-strung intelligence. Her sparkling eyes compete with the stars on the garish wallpaper behind her, presumably the same paper that decorated their rooms at the Hôtel du Tigre. 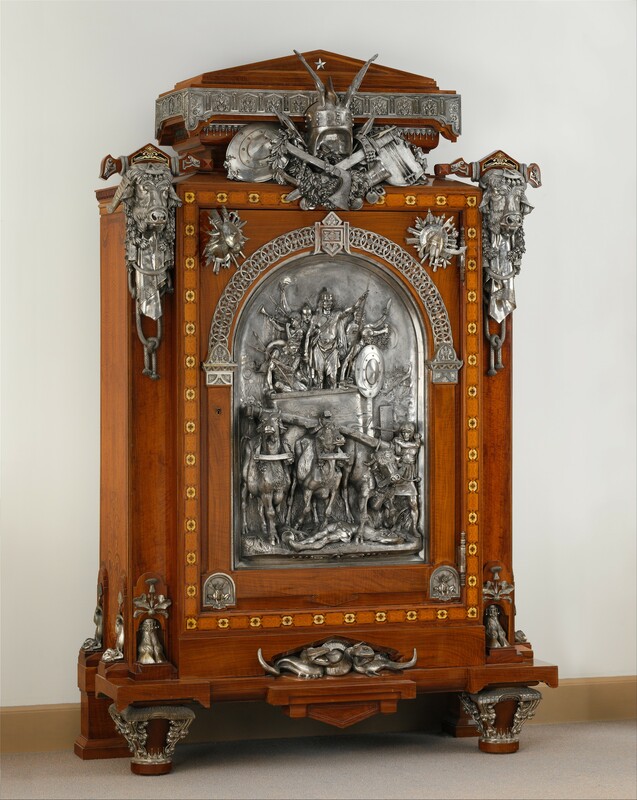 When the prototype for this compelling cabinet, now in the collection of the Musée d’Orsay, Paris, was exhibited at the Exposition Universelle in 1867, it received mixed criticism. The cabinetmaker must have been pleased with the controversial piece because he commissioned this second, nearly identical one for himself. The central plaque by the sculptor Emmanuel Frémiet commemorates the military triumph of Merovech (d. 458), leader of the Salian Franks, over Attila and his marauding Huns at the Battle of the Catalaunian Field in 451. In a vivid and unsettling representation, Merovech stands before his troops at the front of the chariot as it passes over the dead body of an opponent. These pistols are part of a deluxe garniture of ivory-stocked hunting arms made for Empress Catherine the Great (reigned 1762–96), whose intial (E for Ekaterine) is on the escutcheons of the grips. The garniture, which originally consisted of these pistols, a fowling piece dated 1786 (National Museum, Warsaw), and a rifle (whereabouts unknown), was later given to her favorite, Prince Stanislas August Poniatowski (1732–1798), whom she backed as king of Poland (reigned 1763–95). Firearms with ivory stocks, generally out of fashion in western Europe by the eighteenth century, were in vogue in the ostentatious Russian court during the last quarter of the century. 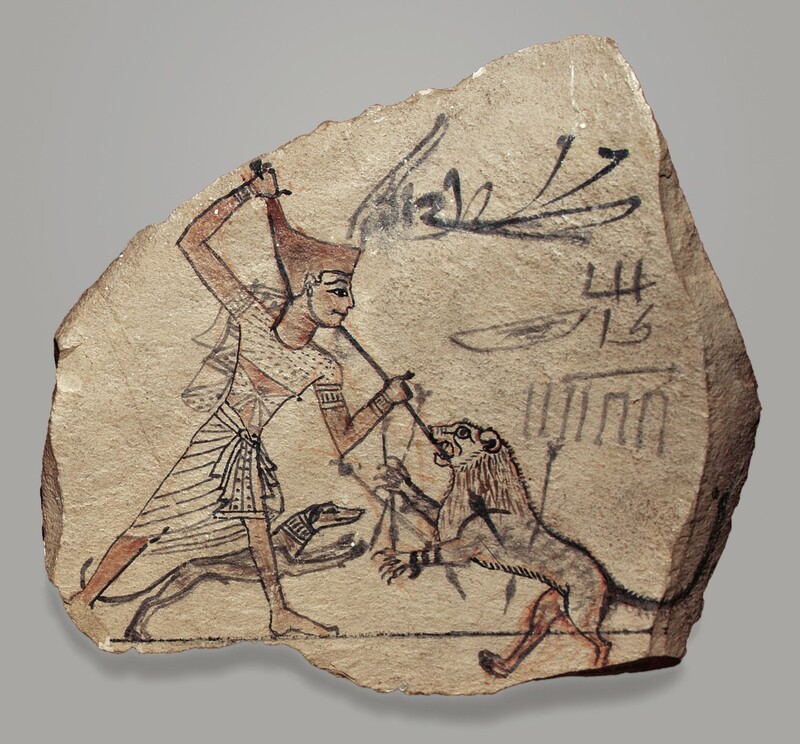 This ostracon, a limestone chip used for sketching, was found in the Valley of the Kings during excavations conducted by Howard Carter on behalf of the Earl of Carnarvon, who received the piece in the division of finds. Although many of the figured ostraca discovered in this royal cemetery were clearly trial sketches made to facilitate an artist’s work, this scene is not found in royal tombs, nor do the figures conform to the strict proportions of a formal rendering. The scene was drawn with great economy of line by the confident hand of a skilled artist who required no grid lines as a guide. It may have been done for the amusement of the maker, or it may graphically represent the artist’s hope that the ruler should be a strong protector of Egypt. A number of vessels similar in form and technique to this one have been excavated in the rich burials at Marlik, a site southwest of the Caspian Sea in northern Iran; one is also known from Susa, in southwestern Iran. On the body of the cup, four gazelles, framed horizontally by guilloche bands, walk in procession to the left. Their bodies are rendered in the repoussé technique and are detailed with finely chased lines to indicate hair and musculature. The projecting heads were made separately, as were the ears and horns, and were fastened invisibly in place by a colloid hard-soldering, a process much practiced in Iran involving glue and copper salt. The hooves and eyes are indented, probably to receive inlays. 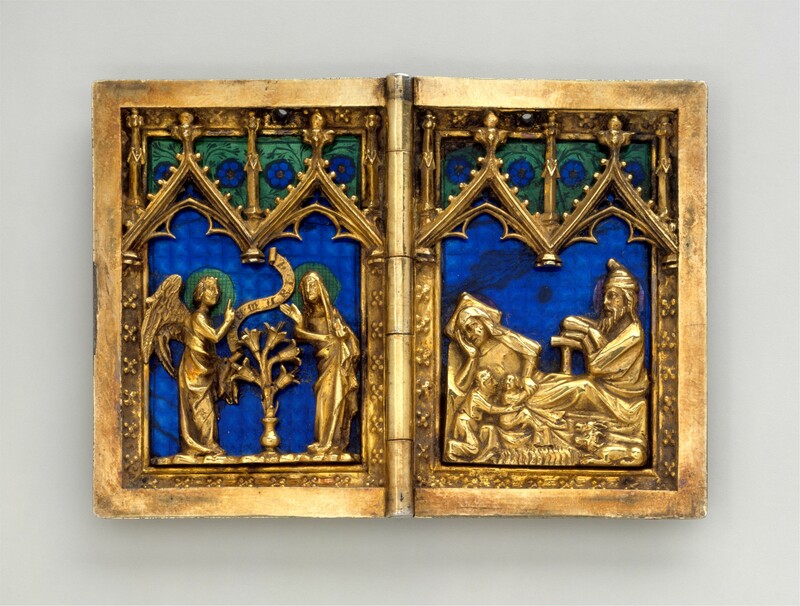 An outstanding example of Gothic goldsmiths’ work and enameling, this small devotional diptych achieves a gemlike quality through its accomplished technique and graceful style. The outer scenes of the Crucifixion and the Resurrection are executed in translucent enamel with details in opaque enamel, while the inner scenes of the Annunciation and the Nativity are in the form of cast reliefs. The diptych generally has been attributed to either a Parisian or a Cologne workshop, but a more precise localization is made difficult not only by the mobility of artists and the resultant transmission of styles, but also by the palpable stylistic differences between the outer and inner wings. In addition, the unusual inclusion of a midwife in the Nativity scene is an iconographic peculiarity that appears for the most part to have been of Austrian origin. 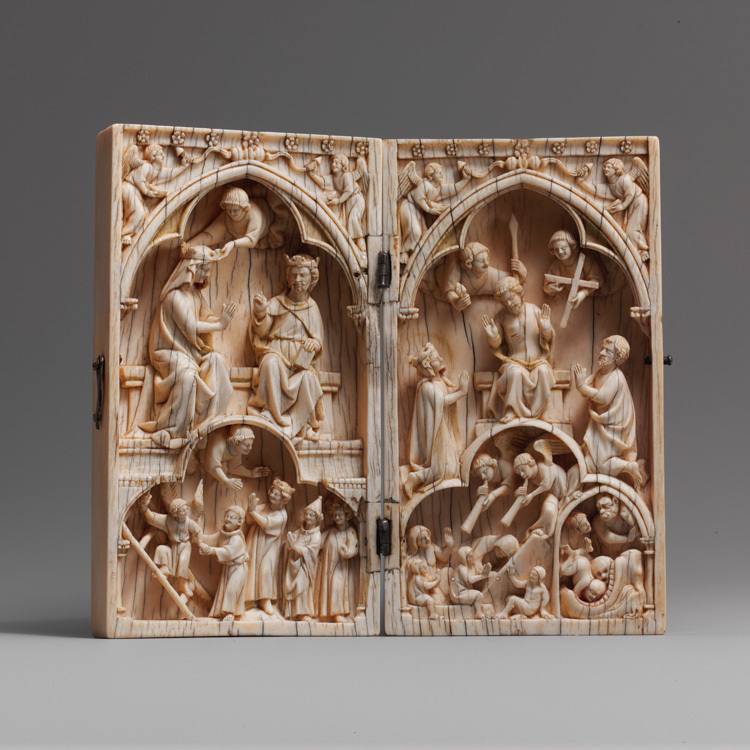 While the place in which this diptych originated remains somewhat uncertain, the essential stylistic qualities of the work link it with Cologne.